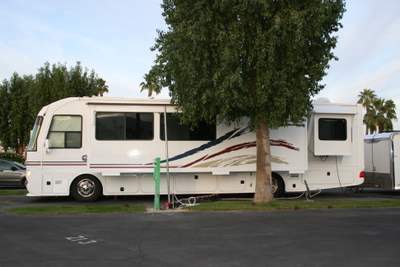 To wire an RV hook-up and service to accommodate an RV you must put some thought into the pre-planning. This article reviews the factors that need to be taken into consideration for successfully wiring an RV service. A number of factors to be taken into consideration which will determine the wire and breaker size needed to power your RV hookup sufficiently. Q: I would like to run a 30amp and/or 50 amp service approximately 120′ from entry service to accommodate a RV motor home. What gauge wire should be used? What amp breaker? A: Due to the length of this run (120 feet. ), to get a full 50A service at 120V, you would have to run #4 AWG copper wire to stay within acceptable voltage drop (3%). You would use a 50A breaker to feed this circuit. To get a full 30A 120V service, you would require #6 AWG copper, fed with a 30A breaker to stay within the 3% voltage drop. If you only want to have the use of the lights, and keep the battery charged, and don’t need the heavy loads such as A/C or washer/dryer, etc., then you could run a smaller service that would be considerably more cost effective. Then you would use the appropriate wire size and breaker. You would then need the approved adapter to plug the unit in, and would have to disable the heavy loads by unplugging them or shutting off and labeling the breakers with a note that the electrical supply is not sufficient to run the heavy electrical loads. This entry was posted in Outdoor Wiring, Wiring Projects and tagged 30 Amp, 50 Amp, breaker, electrical system, power, RV, RV electrical load, RV service, voltage drop, wire, wiring an RV service. Bookmark the permalink.